smonk you: the best freaking daddy blog ever: What does a cow say? smonk you: the best freaking daddy blog ever: What does a cow say? I love a good coyote farm. What does the cow say? Miloh has no idea. He doesn't know what a sheep says. He can't tell you a pig says oink. Or that a Horse says neigh. And he'd guess neither bow nor woof if asked what a dog says. Miloh doesn't know his animal sounds. And I don't really care. 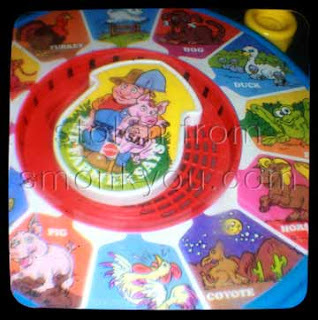 There's some baby milestone sheet that mentions how many animals sounds a kid should say by a certain age. The reason I'm a bit fuzzy on that is I didn't really pay attention to that... Or really care. We don't live on a farm, in a jungle or a zoo. There's no need for him to know what sound a penguin makes (apparently it's onk). I don't get why he needs to know them now. I'm not against teaching them to him... It's just not something that was top of mind for us until we noticed that all the kids in his gym class knew them. But I caved... I started singing old McDonald to him. We say the sounds of animals in books we read him. We're just trying to keep up with the Joneses. Although I know that 30 years down the road it won't matter that he didn't know any animal sounds until months after his peers did. I wanted to end this with the clip from the Flintstones where they sing Old MacDonald and people from other nations make the sounds they say in that language. But alas I can't find that so I leave you with this link to a page that has the sounds animals make in other countries (although I have a suspicion that the animals sound the same no matter where they are). I wrote this post a week ago and was planning on posting today. In that week Staci put Miloh into an animal sound bootcamp. He can do cow, duck, dog and monkey sounds. And oddly today he pointed at a stegosaurus on his placemat and said roar. We never taught him dinosaur sounds but thanks to our friends Lars and Lily we read him Dinosaur vs. the Potty often. The dinosaur says roar on every page. So I guess he figured that one out. Although the dinosaur in the book looks like a T-rex so I think he's just guessing that a stegosaurus says the same. And who knows what they said anyway. Animal sound boot camp? THAT is funny! I agree, though there are certain milestones that I question as well. Pretty silly stuff people come up with. That's too bad. B knew his sounds at 12mths and was able to identify a crow from a gackle by 18mths. I always just thought (and still think) that the focus on animal/animal sounds were not so much because animals were so important, but because they are easy sounds, and also an easy way to help the baby start to make associations. We have two big dogs that sometimes bark. R learned early on that the dog says "woof" just because we said it a lot. Now, if he sees a picture of a dog he points and says "the dog...woof." Or if the dogs wake him from a nap, when we go to get him he looks at us forelornley and says "the dog...woof" (with the look on his face totally conveying the sense of "I'm so sad because the dog barked and it woke me from the best nap ever! ").